In this era of the 21st century, access to the internet is a necessity and a lot of people out there cannot go a day without internet access. Having internet access is not the only ssh but also being able to share it with colleagues, either at home, work or even at school. With the introduction of smartphones now anyone can share their internet connection in a matter of some few taps. 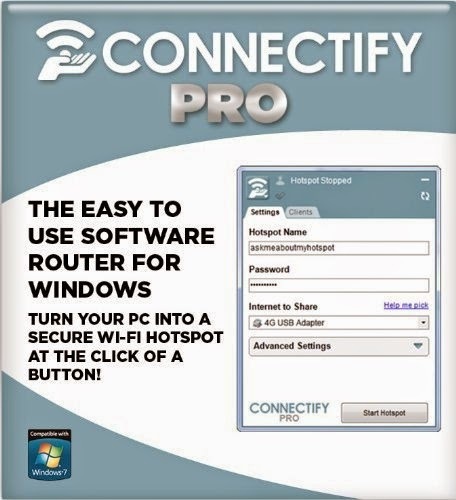 Now to those who access the internet through 3G and 4G adapters connected via laptops and PCs, Have you ever wondered on how you can share the connection with your friends or even share it with other devices? There is a way out. hotspot, and get all of your devices online simultaneously, and at a fraction of the cost. the value of your 3G/4G card and get all your peripherals online at the same time! Unzip folder and install Setup. When installation is done, close it , if ask for reboot cancel it and don't run it yet. Copy files from cracked folder into "C:\Program Files\Connectify" or "C:\Program Files (x86)\Connectify"
Now you can boldly Restart your computer.